In this large scale hospital project, several medical institutions with independent operation share the medical resources via the central medtech area, and combine a whole which can’t be separated from each other, and benefit mutually. Architectural design is inspired by paper cutting, the gentle and flexible façade and ubiquitous garden elements, all of which together build a convenient, efficient and pleasant gardenized space. Pukou Medical Center is China's first medical complex which gathers several medical institutions. It is made up by five medical institutions. This medical complex can easily gather several public and private medical institutions, and become a leader who integrates and optimizes medical resources. The proposal is constituted by four essential parts: the central medtech area, all hospital units, the landscape around hospital, underground logistics and transport hub. These parts constitute a whole of harmonious coexistence. Each clinic and hospital has a clear connection with other clinics or hospitals, but they can also independently operate and expand. We hope to design a hospital with centralized layout, which contains the most widespread courtyard space, the shortest flow, as well as the most convenient transport links. Design inspiration comes from Chinese folk paper-cut art. The whole proposal seems like to be stacked up softly, not only embodies the artistic aesthetic feeling, and meets the requirements of space use in the project. Project continue the practice of the gardenized space, garden elements are spread and penetrated into all parts of the hospital as much as possible, at the same time introduces various shallow pools to make buildings part of natural scenery. 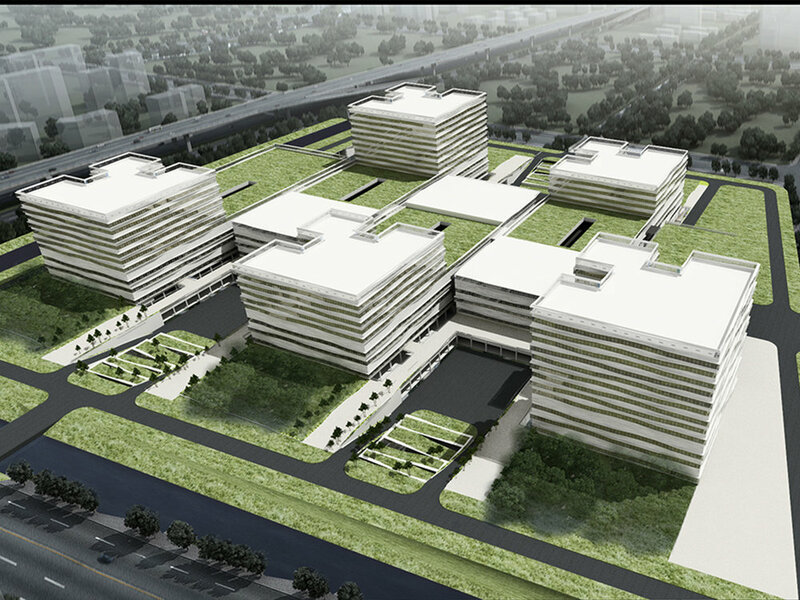 In order to create an efficient medical hub, each part of proposal adopts the centralized layout to ensure that the flows of patients reaching all departments are not affected by wind and rain. At the same time, the flow of medical staff and patients can be separated.